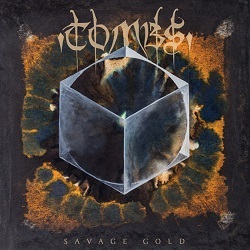 Brooklyn, New York’s TOMBS‘ have confirmed Savage Gold as the title of the band’s third album on Relapse Records. The album is set for a June 10th release (North America), June 9th (UK/Europe/World), and June 6th (Germany/Benelux/Finland) and today the artwork and track listing have been revealed. The stunning artwork was created by renowned tattooist Thomas Hooper who has created the band’s previous album covers. Savage Gold focuses the awesome strength of TOMBS‘ previous works into one brilliantly dark post-punk and extreme black-metal masterpiece. Recorded and produced by Hate Eternal’s Erik Rutan (Cannibal Corpse, Goatwhore), Savage Gold both expands upon the moody post-punk foundations that TOMBS‘ prior albums explored while also bringing out the band’s most traditionally metal moments yet. Once every few years a record comes along that sets a new benchmark for what can be done in heavy music. This is that moment and this is that record. Savage Gold is one the most anticipated underground metal album of 2014 as stated by Decibel Magazine, Revolver Magazine, Noisecreep and numerous other outlets. The band’s sophomore LP Path Of Totality unanimously topped 2011 end of the year metal lists (everyone from Decibel to Pitchfork to NPR, and more, dubbed it their top album of that year). Formed in 2007 by singer / guitarist Mike Hill (Anodyne, Versoma) in Brooklyn, NY, TOMBS blends a wide array of influences including Black Metal and dark industrial music. The band went through a number of line-up changes with Hill the only remaining original member. Former members included Domenic Seita (Storm of Light) and Carson Daniel James. The band’s prior Relapse output included a self-titled EP and a split 12-inch with like-minded, Germanic darkness weavers Planks. Both records were release on Hill’s now-defunct label Black Box Recordings. The band’s first two Relapse releases, 2009’s Winter Hours and 2011’s Path of Totality both received massive reception from the press with the latter being featured prominently on many critic’s year end metal lists including Pitchfork, Brooklyn Vegan, NPR and MetalSucks. The crowning achievement was securing the 2011 album of the year for Decibel Magazine. In addition to their critically acclaimed releases, TOMBS has become known for their captivating live performances and have toured extensively throughout North America and Europe with bands ranging from Isis, Pelican, Wolves in the Throne Room, The Secret and Kylesa.